The Capped Bust Half Eagle with small eagle reverse. Capped Bust Half Eagles - First ever gold coins distributed by the U.S. Mint! 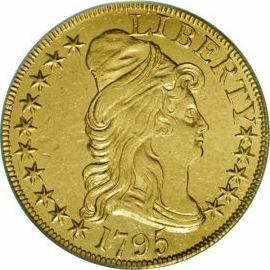 The Capped Bust Half Eagle (small eagle reverse) was made between 1795 and 1798. These gold coins are distinguished as being the very first gold coins produced by the U.S. Mint. The first delivery of 744 half eagles happened on July 31, 1795. The total recorded mintage for the series only amounted to 18,512 pieces. Most of these coins were melted in 1834 and the majority of the survivors are dated 1795.
fifteen to sixteen 6 pointed stars. Above the design reads the inscription "LIBERTY" and the date below it. was very short lived and not accepted by the general public. 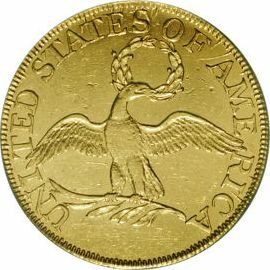 The small eagle reverse was often called the "chicken eagle" reverse.